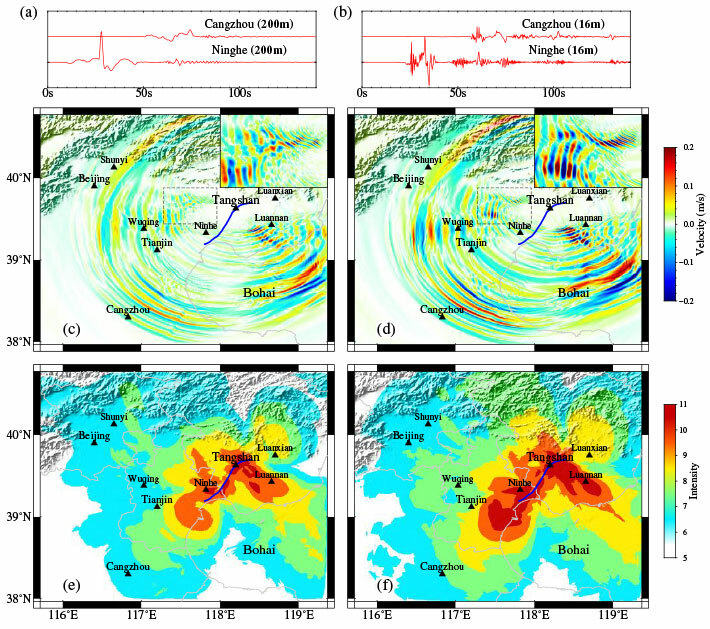 Simulated ground motions of the 1976 Tangshan earthquake that resulted in a 12-member team of Chinese researchers being awarded the 2017 Gordon Bell prize. Image courtesy of Haohuan Fu, Tsinghua University, et al. A Chinese team of researchers awarded this year’s prestigious Gordon Bell prize for simulating the devastating 1976 earthquake in Tangshan, China, used an open-source code developed by researchers at the San Diego Supercomputer Center (SDSC) at UC San Diego and San Diego State University (SDSU) with support from the Southern California Earthquake Center (SCEC). Using the Sunway TaihuLight, which is currently ranked as the world’s fastest supercomputer, the team developed software that was able to efficiently process 18.9 Pflops (18.9 quadrillion calculations per second) of data and create three-dimensional visualizations of the 1976 earthquake that occurred in Tangshan, China, believed to have caused between 240,000 and 700,000 casualties. The computation was performed for a 8-meter grid space and produced ground motions up to 18 Hz. The team’s software included innovations that achieved greater efficiency than had been previously attained running similar programs on the Oak Ridge National Laboratory’s Titan supercomputer and the TaihuLight supercomputers in China. The open-source AWP-ODC code is used by SCEC to simulate how earthquakes make the ground move, and is a breakthrough for predicting ground motions that affect small homes and structures, which are vulnerable to high-frequency shaking. In 2015, SDSC and SCEC researchers received NVIDIA’s 2015 Global Impact Award for their collaborative work for further developing the AWP-ODC code with accelerated GPUs (graphics processing units) to simulate earthquake physics necessary for safer building design. This year’s Gordon Bell prize winners are not the first to develop algorithms for supercomputers in an effort to simulate earthquake activity. In the abstract of their presentation, researchers noted that the innovations included, among other things, developing a customized parallelization scheme that uses the TaihuLight supercomputer’s 10 million cores efficiently at both the process and thread levels, as on-the-fly compression that doubles the maximum problem size while improving performance by almost 25 percent, which could be applied to other scientific challenges at the exascale computing level. Recipients of the 2017 Gordon Bell prize are based at Tsinghua University and National Supercomputing Center, Wuxi, China; Shandong University in Jinan, China; and Southern University of Science and Technology, Shenzhen, China. The leading author is Haohuan Fu, with Tsinghua University and National Supercomputing Center. As an Organized Research Unit of UC San Diego, SDSC is considered a leader in data-intensive computing and cyberinfrastructure, providing resources, services, and expertise to the national research community, including industry and academia. Cyberinfrastructure refers to an accessible, integrated network of computer-based resources and expertise, focused on accelerating scientific inquiry and discovery. SDSC supports hundreds of multidisciplinary programs spanning a wide variety of domains, from earth sciences and biology to astrophysics, bioinformatics, and health IT. SDSC’s Comet joins the Center’s data-intensive Gordon cluster, and are both part of the National Science Foundation’s XSEDE (Extreme Science and Engineering Discovery Environment) program.